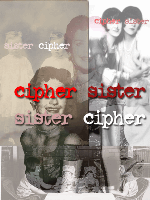 CIPHER SISTER follows a simple premise inspired by a true story: “The sheriff's department in El Dorado County broke protocol this week and released the names of two deceased residents without notifying their relatives. The problem is they can't find any relatives of the twin sisters who were found dead inside their South Lake Tahoe home last week. The bodies were discovered on Feb. 27, according to the sheriff's department. Authorities say they most likely died within a short time of one another of natural causes. They had been dead for several weeks before they were discovered, according to reports. The sheriffs haven't been able to locate the next of kin of the women. Apparently throughout their lives, they always listed each other on all official forms.” Their names are Lucy and Darcy. We’re putting their lives back together in imperfect fragments. We want your take on things: not of how they were born or died, but how they *lived*. Pick a spot on their timeline (1939-2012) and show us a piece of their lives, be it five minutes of childhood or ten years of adulthood. Who were they? Where did they work? What kinds of adventures did they experience? Who did they love? NNo monetary payment +Royalties No monetary payment. Royalties.